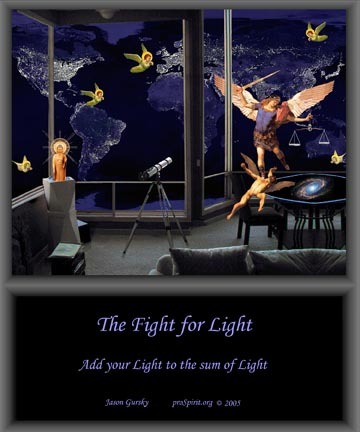 The Fight for Light is available as prints from art.com in the following sizes and costs. Shipping and sales tax are extra. Posters are printed at 300 dots per inch (dpi) and will be clearer than displayed on the Internet at 72 dpi. The poster is the image only and does not include the color matting examples. The different size Galleries are necessary due to the problems of resizing geometric ratios. 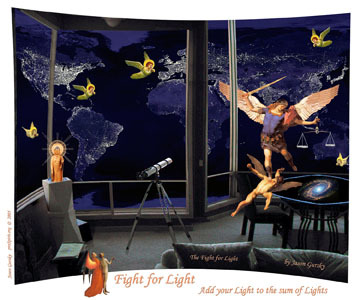 If you're interested in prints check out Jason's proSpirit Re-Creationist Art Gallery on Shutterfly.com.